Here's the crew from American Installation Services, led by Bob Maziarz (second from right). Although the wind howled all day and the temperature hovered in the low 50's,the crew managed to catch near limits of rockfish on October 27. 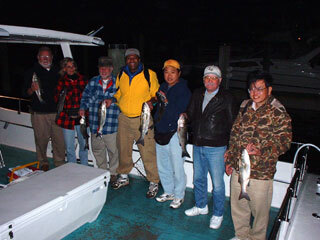 And here we have the Louie Phipps (second from left) crew of October 21. They really did catch their limits of stripers. 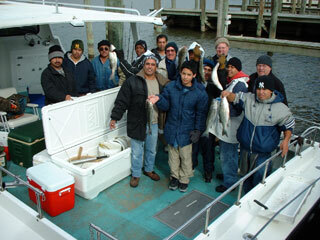 Here's the Paul Kowalski crew from October 19, shown with part of their limit catch of rockfish. 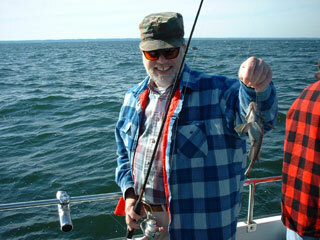 Although it's hard to see, here is a small black sea bass that was caught while chumming for rockfish. 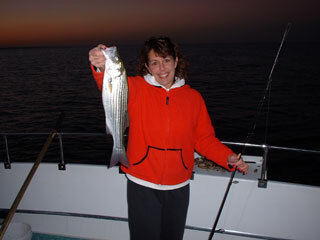 And here's Lisa Preuss with a fine striper she caught while fishing on the Worm on October 18. Lisa, who's from Dallas, was visiting family in the Beach.